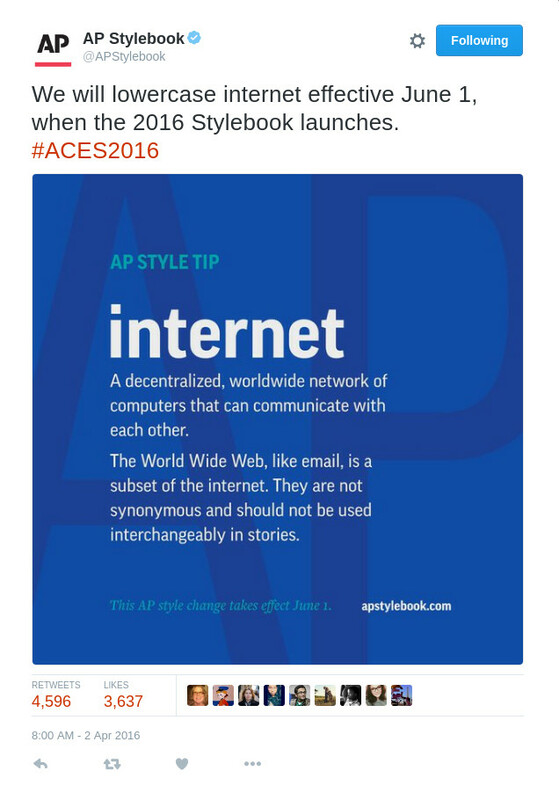 AP Stylebook's tweet on the editorial policy shift. The reductions of e-mail to email, Web site to website, and Internet to internet make sense to me because they are such integral parts of our lives that they should be easy to type. A sloth's justification. The real justifications for dropping the upper case I are more along the line that there was really never a reason to capitalize internet in the first place, and the writing and editorial world is breathing a collective sigh of relief because the Associated Press Stylebook has finally caught up to reality. AP defines style not only for dispatches of the Associated Press, but for newspapers generally, and for many magazines, newsletters, and other publications. The AP changed its preference from "Web site" to "website" in 2010 and "e-mail" to "email" in 2011. The lower-case form of internet officially became preference yesterday (1 June 2016). All of these changes are greeted with a jeering "It's about ... time!" reminiscent of a drunk waiting for a slow taxi, but the AP Stylebook derives some of its authority from its Ent-like deliberation of any change. If, instead, the AP changed policy with every shift of the wind, it would systematically destroy its credibility. Style in this context isn't about fashion. It's not decorative ruffles and flourishes, high-class quality, reserve, understatement, or literary devices—such qualities, if covered by a stylebook at all, are usually relegated to the appendix. Stylebooks concern themselves with practical matters of word choice and punctuation. They pick up where grammar leaves off. There may be a hundred grammatical ways to write my next sentence, but a stylebook helps me choose a way that is editorially consistent with the publication. Reading establishes a mind-to-mind link between reader and the narrative voice of the reading matter, and the objective is for the apparatus between reader and voice to disappear so that it doesn't disrupt that fragile link. Inconsistency in text disrupts the link, so by choosing and using a stylebook I can achieve a style that will keep disruptions of the reader's attention to a minimum. Of course the AP's isn't the only stylebook in town. In the United States, the [University of] Chicago Book of Style ("The Chicago Book") gets used in publishing generally. The Publication Manual of the American Psychological Association ("APA") governs the APA's many publications. For the sake of interchangeability, most any publication in the fields of psychology, psychiatry, mental health, and social sciences also use the APA. College students are typically bound by the MLA Handbook for Writers of Research Papers ("MLA Style") unless they are in one of the social sciences, in which case their writing will be governed by the APA. The particular person and the occasional writer in need of style advice will likely turn to The Elements of Style by William Strunk, Jr. and E. B. White ("Strunk and White"), which is highly respected for solving the most common inconsistencies in English—that 20% of broken rules that account for 80% of the errors—with a short list of pithy rules, though The Careful Writer by Theodore Bernstein covers much more arcane questions of the sort that will come up on a day by day basis. My druthers are to eat, sleep, and breathe Strunk until I absorb it by osmosis into the core of my being, then and only then to use Bernstein as a reference book in which I look up the more arcane questions. There's something endearing about The Elements of Style where other stylebooks are purely utilitarian, though Strunk's pithy text leaves even less room for endearment than the typically utilitarian stylebook, which is no more endearing than a dental student's text on root canals. I think it's E.B. White's introduction in which he reminisces of his student days with Strunk and his self-published textbook, The Elements of Style. In 1954, some years beyond Strunk's classroom, White, now a staff writer at The New Yorker and the successful author of Charlotte's Web and Stuart Little, got permission to update the little book and bring it into the then present. This list is only for the US. British usage varies so much from American usage that it has its own set of books. Wikipedia provides a good list of stylebooks on a per country basis. Anyway, I've saved you a keystroke: next time you type internet, you won't have to push the Shift key. You're welcome.